The gentians are named after King Gentius of Illyria (c. 500 BC), who is credited with discovering their medicinal value. Gentians produce some of the bitterest compounds known to man, discernible to our taste buds in concentrations as low as one part in 50,000. They have been used to set the scientific standard by which bitterness is measured. Gentians are an essential ingredient in medicinal "bitters," which are taken to regulate digestion. There are also popularly consumed in a variety of alcoholic drinks including cocktails. This rare Tibetan species of gentian is an upright plant, 60cm/2ft tall, with leaves 30cm/12” long. Flowers appear on the top of the stem in clusters, cupped by the broad, glossy leaves. Although gentian blue is the colour most associated with these gentians, the flowers of Tibetan gentian are greenish white and tubular, appearing in late summer or early fall. Unlike other gentians, this one is easy to raise from seed. It is undemanding, growing in ordinary garden soil. It is a real novelty for the mixed border or cottage garden, and it is attractive to bees and butterflies. 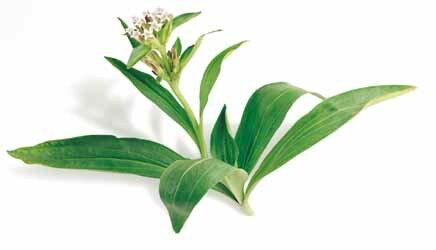 Used in Chinese medicine to expel wind dampness, damp heat, jaundice, for dry constipation, and as a tonic.